The New York Yankees not only bolstered their bullpen for the stretch and postseason run on Tuesday, but they also kept two of their biggest rivals in the American League from doing the same all in one big move acquiring Zach Britton from the Baltimore Orioles for three prospects. While many may have thought that giving up a trio of young pitchers up in the deal others would argue that the fact that the acquisition kept Britton out of the bullpen for the Boston Red Sox and the Houston Astros make the cost worth it. Will Britton, a true rental, be worth the cost of RHP Dillon Tate, RHP Cody Carroll and LHP Josh Rogers? Before we begin to even think about answering that question we first have to meet the man, so let’s do it. This is Meet a Prospect Special Edition: The Zach Britton Edition. Zachary Grant Britton was born on December 22, 1987 in California and was raised as the youngest of three brothers in Santa Clarita, California. Britton attended Canyon High School before his family moved to Texas. It was in Texas where the left-hander attended Weatherford High School and played as an outfielder and a pitcher for the school’s team. While pitching there the Baltimore Orioles drafted him as a starting pitcher in the third round of the 2006 MLB First Year Player’s Draft, 86th overall. Britton had offer sheets for scholarships from Texas A&M University but ultimately decided to forego his commitment and begin his professional career with the Orioles immediately by accepting a $200,000 signing bonus. Britton spent parts of the 2006 – 2010 seasons in the minor league system for the Orioles before finally getting a true shot with the club in 2011. Britton was sent down to Triple-A to start the 2011 season but an injury to starter Brian Matusz led the team to call up Britton to fill in for him. Britton spent time down in Triple-A later in the season, many wondered if it was because the Orioles were trying to manipulate his service time in order to gain an extra season of team control before he hit free agency but ended his season with 28 starts with the Orioles amassing a 4.61 ERA, a 1.45 WHIP and an 11-11 record. Britton had to wait until July of 2012 before he could begin his sophomore season after heading to the disabled list with a left shoulder impingement. Britton suffered a bit of a sophomore slump in 2012 posting a 5.07 ERA in 12 games, 11 as a starter, with a 5-3 record. The Orioles optioned Britton back down to Triple-A to begin the 2013 season and would only pitch in eight games for the Orioles Major League club, seven of them starts, pitching to a 2-3 record in just 40 innings of work. The Orioles begun the process of converting Britton to a bullpen arm rather than a starter after another tough campaign for the young left-hander. Britton made the Orioles Opening Day roster in 2014 as a relief pitcher and eventually as their closer where he converted 37 of 41 save opportunities while pitching to a 1.65 ERA. Britton would help the Orioles sweep the Detroit Tigers in the 2014 American League Division Series before losing in the American League Championship Series. After a strong 2014 season the Orioles and Britton agreed to a $3.2 million deal for the 2015 season thus avoiding an arbitration hearing. Britton rewarded the Orioles that season with 36 saves in 40 opportunities, a 1.92 ERA and his first MLB All-Star Game selection. 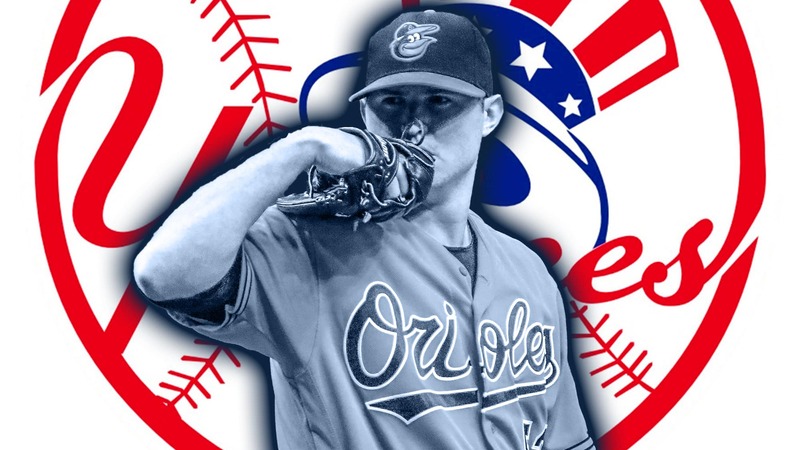 Britton once again avoided arbitration with the Orioles in 2016 after signing a one-year deal worth $6.75 million and once again earned a trip to the All-Star Game with Baltimore that season as well. Britton converted his first 33 saves to start the season setting a new MLB record for the most consecutives saves to start a season by a left-handed pitcher and matched the seventh longest stretch of all-time to start a season. Later that season Britton set the MLB record for the most consecutive relief appearances without allowing an earned run, 39 appearances at that point. Britton pitched in 43 straight appearances without giving up a run that season before allowing a run to the Washington Nationals on August 24. Britton pitched in 69 games that season and allowed just four runs all season, which equated to a 0.54 ERA. This mark broke the MLB record for the lowest single-season ERA by a pitcher with at least 50 innings pitched and helped the Orioles lefty convert all 47 of his save opportunities on the season. In 2017 Britton saved his first game that season, a victory over the Toronto Blue Jays, which gave him his 50th straight save dating back to October of the 2015 season. Britton would end up converting 55 straight saves to set an American League record before blowing a save on August 23rd against the Oakland Athletics. Britton would only make 38 appearances in 2018 due to spending time on the disabled list with left forearm tightness twice and would ultimately suffer a ruptured Achilles tendon after the season which kept him out of action for six months. Britton would ultimately sign a one-year deal worth $12 million to avoid arbitration in his final season of eligibility before beginning the season on the 60-day DL due to the Achilles tendon. Britton made his debut off the disabled list on June 12 and notched his first save 11 days later on June 23. Now Britton, a left-handed closer that possesses a 99 MPH sinker, a four-seam fastball that sits around 96 MPH, and a curveball that ranges in the 82-83 MPH range, is a member of the New York Yankees after being acquired by the team late on Tuesday night. Welcome to the organization Zach and welcome to the family… even if it is temporary! No mention of the famed 2016 Wild Card game when Buck Showalter failed to use Britton, thus ending their season when Edwin Encarnacion homered off Ubaldo Jimenez in the 11th inning. It was a Britton highlight even if he didn't make it into the game. How do you leave Baseball's greatest closer that year on the bench?